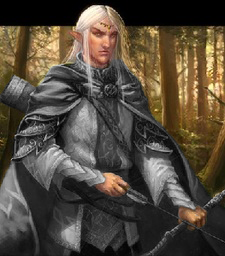 This well dressed elf in a gray cloak and robe armed with an elven blade and ornately carved long bow. He seems to carry the weight of the realms on his shoulders. Transmutor +2 Physical Enhancement is typically put in DEX. Aeron Shandra grew up in the elven kingdom of Aelvinwode near the city of Deepgrove. He showed great affinity for magic and was classically trained in magic and alchemy. His family arranged for an apprenticeship with the High Wizard Rashemon in the neighboring city-state of Falconaire. As a junior apprentice Aeron has been assigned to a border outpost of Falconaire and is kept busy scribing scrolls and mixing Greek Fire for the armory. His incredibly sharp intellect was finally noticed after months of toil in the tower laboratories. Aeron was promoted to Senior Apprentice by High Wizard Rashemon and sent as the arcane advisor to a small group of elves and humans investigating blood magic proliferation in Falconaire. The party successfully returned after finding and destroying a fallen star that was being used to create blood magic items. In the course of discovering the local source of blood magic corruption, Aeron became increasingly suspicious of one of the party members. He shared his suspicions privately with the wizard tower’s leadership but there were larger issues for their attention. Falconaire’s borders were being tested by invaders from the east, Aeron left immediately to meet with the leadership in Aelvinwode and discuss the possibility of another wizard tower to be constructed on the southeast border of Falconaire to control enemy movements into the Gloaming Hills. Aeron’s meetings with the royal advisors in Aelvinwode made great progress, but there were many details that where still unresolved. His experiences with these weighty concerns of Falconaire and Aelvinwode were changing his perspective on how to solve such delicate issues. A pragmatic approach was necessary to make quick progress in this dangerous time. Aeron had his clothes dyed a slate gray, the color of elvish druids in Glenfar, to signify his transition to a more balanced philosophy. Aeron rapidly constructed a wizards tower and outpost on the Falconaire Aelvinwode border and was given 3 apprentices from Aelvinwode. The outpost was named Farhills.